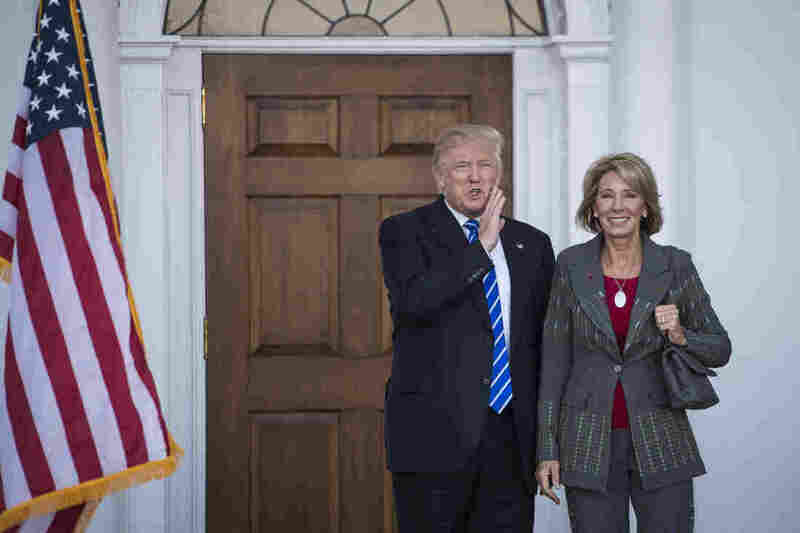 Trump Chooses Betsy DeVos For Education Secretary : NPR Ed The Michigan activist and philanthropist is a strong advocate for school choice and vouchers. President-elect Donald Trump stands with Betsy DeVos after a meeting at Trump National Golf Club Bedminster in Bedminster Township, N.J., on Saturday. DeVos is chairman of The Windquest Group, a Michigan-based investment management company. She is married to billionaire Richard DeVos Jr., the son of Richard DeVos, who co-founded the home care products company Amway. Trump, in a statement, called DeVos "a brilliant and passionate education advocate." He added that she would have the leadership ability to "break the bureaucracy that is holding our children back." Largely unknown outside of Michigan political and philanthropic circles, her appointment signals that Trump intends to make school choice and a voucher plan for low-income families a centerpiece of his education agenda. School choice plans are controversial because in some cases they can allow families to use public funding for private schools. Critics say choice plans undermine public education, are often underregulated and can amount to profiteering. Not surprisingly, Trump's selection of DeVos as his education secretary drew swift reaction from the head of the nation's largest teachers union. Lily Eskelsen García, the president of the National Education Association, slammed the choice, saying it would undermine public education. DeVos "has consistently pushed a corporate agenda to privatize, de-professionalize and impose cookie-cutter solutions to public education," Eskelsen Garcia said in a statement. "By nominating Betsy DeVos, the Trump administration has demonstrated just how out of touch it is with what works best for students, parents, educators and communities." Rabbi Jack Moline, president of the Interfaith Alliance, called the pick "deeply disappointing. It suggests that he has little regard for our nation's public schools or the constitutional principle of separation of church and state." DeVos currently chairs the board of the American Federation for Children, a group that according to its website works to provide families "with access to great schools through private school choice." Her children attended private Christian schools. She also sits on the board of the Great Lakes Education Project, a pro-charter school lobbying group in Michigan. DeVos has helped make Michigan's charter schools among the least regulated in the nation. Some 80 percent of the state's charters are run by private companies. Trump has voiced strong support for school choice and charters. But otherwise DeVos would seem an unorthodox choice. She is not a Trump loyalist. And some Trump backers feel betrayed by the pick because DeVos has been part of groups, including the Foundation for Excellence in Education, which promote choice and have supported the Common Core State Standards, which Trump opposes. DeVos released a statement on her website saying she opposes Common Core, writing "along the way, it got turned into a federalized boondoggle." But some Trump backers are not convinced. "I am disappointed," said Shane Vander Hart, with the education group Truth in American Education. "I was hoping he would appoint someone who is solidly anti-Common Core. It's hard for me to believe she is truly opposed. Actions speak louder than words," Vander Hart told NPR. Jason Miller, communications director of Trump-Pence Transition, said in an email that Trump "has been consistent and very clear in his opposition to Common Core. Anybody joining the Administration is signing on to the President-elect's platform and vision for moving America forward." DeVos was twice elected chairwoman of the Michigan Republican Party and served as a Republican National Committee member in the 1990s. But she has limited experience grappling with national education policy, public education or running a large federal bureaucracy. She actively campaigned for Trump's rivals during the Republican primaries. DeVos backed Jeb Bush and later Marco Rubio and John Kasich. She did not actively support Trump after he won the nomination. In March, she told the Washington Examiner, "I don't think Donald Trump represents the Republican Party. I continue to be very optimistic that as we get further along into the process, the more voters know about him, and the more informed they are, the more they're going to continue to break away." Getting rid of those standards in math and English is one of the few education issues Trump mentioned during the campaign. The president and Department of Education, however, have no formal authority to undo those state-level academic standards. But backers want him to incentivize states to replace the Common Core.